As requested, this is a post pertaining to my teaching of Gaeilge in the senior classroom. I introduce our new vocabulary at the start of the lesson via flashcards. I then play a quick vocabulary game, e.g. Deir Muzzy/Focail Leadog/ Verb Race etc. I use a power-point based on the theme we are doing which is usually based on a story to introduce vocabulary and tenses. I prepare the reading for the week with the class. I take them in groups of five and we go through our reading. Our reader is Am don Léamh, which has nice short stories, so we would do two a week. I give reading only for homework on Monday night. As we read through it we circle the verbs and new vocabulary. I listen to the reading from the previous night and we go through the questions. I assign their homework based on the story. We then start our grammar class. I try to cover one area of grammar a week. I usually give work based on verbs for homework. Wednesday we start our second story, we go through the reading/new vocabulary etc. I read the story, they read it aloud together and then I pick people to read a sentence or two each. We also do listening work on Wednesday and something fun, like this week we made menus, next week we’ll be decorating and making ‘House for Sale’ posters. Thursday we revise the vocabulary we learned and also the grammar. So, the children might come up to the board and try make sentences using our new verbs and vocabulary. I give the children flashcards and they write a verb they learned during the week on the flashcard and decorate it. We also have comhrá on Thursdays. The children speak in pairs to each other using the new phrases and vocabulary, so far we have been doing Mé Féin. I circulate the room asking questions and prompting. We only have a short Irish lesson on Friday. We have our test, and then some Irish games. That’s it, nothing too exciting but it is one area I really want to work on and make more fun this year! 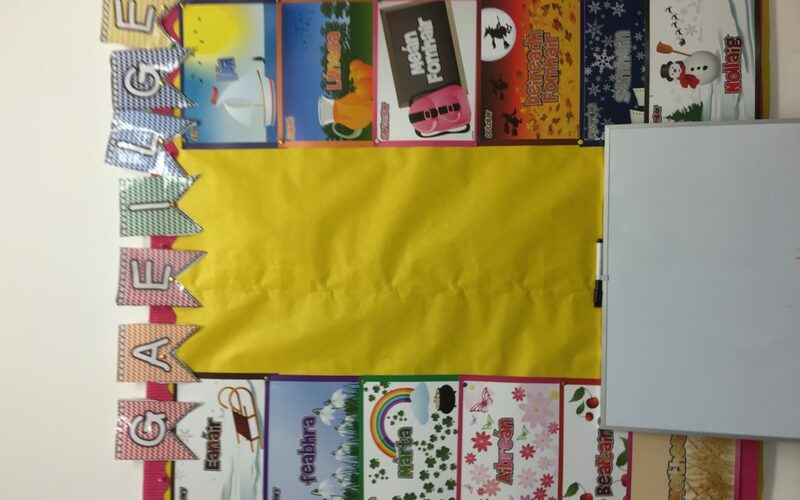 I use the posters from Béal Beo for oral language at the start of every lesson. Their interactive resources are excellent too and I use these Monday-Wednesday. I’ve a weather map on the board too and each day a child comes up to say the forecast. I haven’t done this yet as I keep running out of time but will do tomorrow!